As we live in an interconnected, digital age, it should be no surprise to see consumer electronics evolve more rapidly than ever before. With this evolution comes, of course, an interesting development in price and affordability: What was restricted to the world’s top militaries and government organizations twenty years ago may now be considered a mere children’s toy. One type of product where this has become especially, and very literally, apparent are drones. Over the past few years, these affordable, but yet highly powerful machines have slowly but surely replaced traditional R/C helicopters and toy planes. It has become the go-to mainstream choice for getting young children interested in aviation in a playful, interactive way. However, you may find it difficult at times to keep up with the sheer amount of choice offered by the saturated market for these devices that has quickly formed during the past couple years. Don’t worry, though. That’s why we’re here. 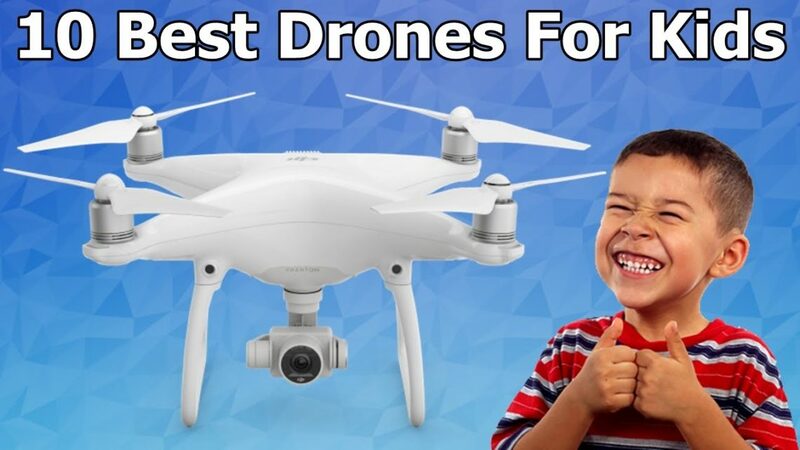 In this guide, we’ll not only compare the best drones for kids out there, but also give you some advice on how to look for the one that suits your child best. Let’s begin, shall we? Here are some highly rated drones listed below. If you know anything about drones at all, you’ve probably heard of the DJI Phantom. It’s the end-all-be-all on the market right now, covering almost any but the ultra-budget segment. Loved for its great out-of-the-box performance, easy controls and long battery life as well as the powerful integrated camera. The DJI Phantom, currently in its third iteration, is offered in many trims. The Standard, as the name implies, sits at the bottom of the barrel, but that shouldn’t be a reason to take it out of the equation at all. In fact, for the steep, Phantom-worthy entry price of just below $500, you get one of the most capable, well-made, yet easy-to-use drones on the market today. 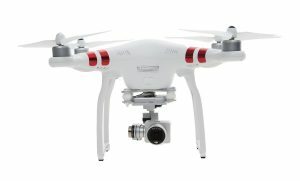 Unlike any other DJI Phantom model, and most drones to begin with, the Phantom 3 Standard features several semi-automatic aids and flight modes. It is designed to help young, new pilots learn the ropes more quickly. 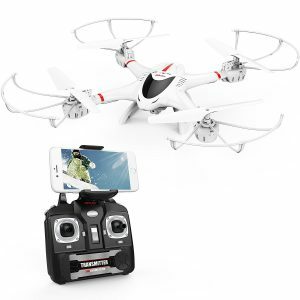 The ability to use the included analog controller, a smart-phone or a combination of both for easy, intuitive flying with an optional high quality live video feed is the icing on the cake. All in all, the DJI Phantom 3 Standard may be one of the best drones you could get your child, no matter if they’re a first-time flyer or not. Beginner pilots will surely appreciate the many helpful features embedded in the Phantom, like the included flying aids and easy controls, but even true pros will love this machine. It hasn’t got its great reputation for no reason, you see. The only hurdle: The price. But what you pay for is what you get. From the little-known indie firm known as UdiR/C comes the Force1. A highly affordable drone targeted chiefly at beginners and those highly conscious of their wallet. 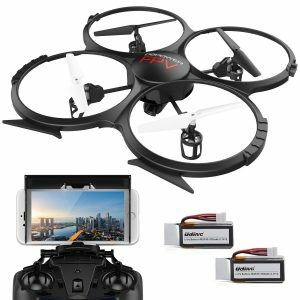 At just $130, this is one of the most valuable drones of its kind out there, making it an excellent entry-level device for those who do not want to spend too much on their first one. After all, what if the toy happens to be a disappointment, or if your child is so fascinated they want to immediately switch to a more capable alternative? These and many more reasons make such a cheap, but practical drone like the Force1 a great option. It comes with anything you would expect even from much higher-priced models. 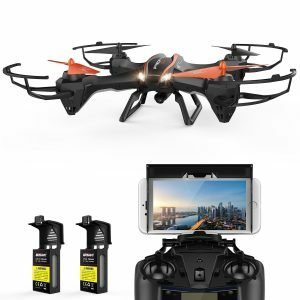 Such as an HD-capable camera, four rotors with guards, helpful when the pilot happens to be a newbie and is still prone to cause accidents, smartphone support, a discrete analog controller and programmable paths as well as some simple beginner-friendly flying modes. The four batteries shipped with the Force1 are not just a nice courtesy, though. They’re also a testament to how quickly this drone can run out of juice: Just 8 minutes is all it takes to completely drain the battery. Moreover, you shouldn’t expect the build quality to rival that of, say, the DJI Phantom. As good as it is, the Force1 remains a $130 product, not a $500 one. In short, the Force1 by UdiR/C is a great choice for an inexpensive beginner’s drone. It looks great, has all the features you’d ever need and is easy to use, as well. What more could you want from a product at this low a price? Perhaps a more solid construction would help. Additionally, some features, like the battery life, leave a bit to be desired and could be improved upon. The Predator is quite similar to their Force1 drone, from a technical standpoint at least. Both feature around the same battery life, though the Predator is reported to sometimes exceed the Force1’s 8 hours by a small margin. Both feature almost identical controls and the same four rotors with embedded guards. The camera is the same, too. The by far biggest difference are the motors, the Predator’s exterior design and build, which have all been slightly enhanced. The looks, for example, are now much more posing and aggressive. While new motors replace the weaker ones from the Force1, granting the Predator some extra agility and speed. On the other hand, the build still leaves a lot to be desired, with cheap, thin plastics still reigning supreme. One other feature that can’t be found on the Force1 is the Predator’s VR support. With separately available goggles, the pilot can experience the entire drone’s flight and control it in Virtual Reality for a perfectly immersive experience. The Predator, being marketed towards slightly older, but still relatively inexperienced flyers, is recommended for users of the ages 14 and above unlike its more general-purpose sister model. At the same price as the Force1, the choice between the two will mainly depend on the age of your child, then. If your child has never flown a drone before, but doesn’t want to enter the world of piloting one of these machines with a mere kids’ toy, the Predator may be just the right thing. It will look cool, be worth bragging about among friends and still offer great performance at a bargain price. Just watch out for build quality issues and the rather low battery life. The low-budget price bracket, as is usual in many markets, seems to be the most densely populated when it comes to drones right now. A good example for this is the Holy Stone F181W, a worthy competitor to the likes of UdiR/C’s products, for example. However, it does come in at just $120, a tad bit cheaper than the opposition. Furthermore, it comes with semi-autonomous flying modes, such as Return-to-Home and a reliable ‘Hold Altitude’ setting. The built-in HD camera doesn’t need to hide from any of its main rivals. The slightly above average battery life of 10 minutes is pleasing in such a budget drone. On the other hand, we weren’t that convinced by the funky-looking analog controller the Holy Stone ships with, which looks like the kind of gamepad you would find on a videogame console. It is tricky to work with if you’re used to more commonly-styled drone controllers, but your child might like it due to the looks. Like many others, but surpassing them in terms of capability and in-air performance, the Holy Stone F181W is a great first drone, especially for children and young adults. Its toy-like quality is not what we would normally expect from something that handles this well, and the same can be said about the video game-inspired controller, but if you can get past that, this is one great deal for one great starter drone. Unlike most of the drones on our list, the DBPOWER U818A is not built akin to a quadcopter, with four propellers sitting on ‘legs’ protruding from the main body, but rather as a true, UAV-like quadrotor. It is a very low-profile design, with a distinctive ‘four circles’ silhouette created by the guards protecting the four rotors”a feature that surely comes in handy when dealing with novice pilots. The HD camera, just as high-fidelity as on most other drones of this type, hangs from an extremely small, round centerpiece. We think this design approach not only works very well aesthetically, providing the U818A with unique, attractive looks, but also from a safety standpoint, as the most important parts of the craft, the propellers and their motors, are guarded from all possible angles on the horizontal plane. Performance is great, too. Although range is quite short, topping out at 80 meters, though 65 or 70 are more likely in practice, most of the U818A’s other qualities are admirable considering the very low $110 price tag. For one, it is very maneuverable, but also easy to control thanks to a great controller with smartphone support. It also features bottom-mounted LEDs, great for visibility in low-light conditions. Even the build quality, something manufacturers of drones this cheap tend to skimp on, is quite good, with thick ABS, robust albeit light in lieu of thinner, easier-to-break plastics used in similar drones. So, if you don’t need a high-range performer and don’t mind the extravagant looks of the U818A, then this might just be one of the best drones out there, price-performance-wise. Definitely worth a look or two. The Cheerwing Syma X5SW-V3 “what a mouthful!” looks strikingly similar to the rather upmarket, not to mention famous, DJI Phantom 3 at first glance, if you squint past the obviously different camera and paintjob. However, looks can be very deceiving here, and it is important to clarify that the two are completely different beasts. 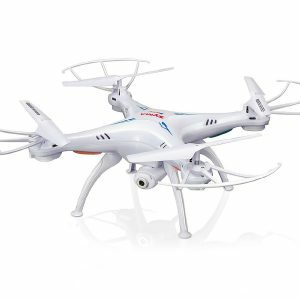 Whereas the Phantom 3 is one of the best amateur-grade drones out there, with a price tag to match, the Cheerwing Syma is designed as a beginner’s toy, a great, simple, easy to maintain and cheap drone to take with you on your first couple flights. It is a very basic machine, but then again, the basic price of $40 befits it. Our main qualms were the limited range, the cheapness of the entire experience and the fact that the Syma doesn’t come with any real flying aids or other beginner-oriented features out of the box. Depending on how safe your child feels controlling a drone, the Syma may or may not be one of the best budget-friendly options out there. Its analog nature provides it with the ability to be customized by almost anyone, in any way, but it also means a very rough, unassisted, potentially unsafe flying experience compared with more expensive, more intricate and more balanced drones. 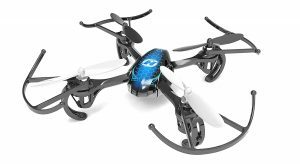 Another Holy Stone product graces our roundup, and this time, it is the ultra budget-friendly ‘nano’ drone, the HS170, available for just under $50. The HS170 was designed from the ground up as a machine that is beginner-friendly, but can also be enjoyed by skilled drone pilots. We found that it mostly lived up to that promise. With great performance provided by almost perfectly tuned controls, a funky-looking LED lighting system that’s nice to try out in the dark and 7 to 8 minutes of flight time, which is more than acceptable, especially given the drone’s small size. High speeds and some great maneuvers could also be pulled off easily and effortlessly with the HS170, a testament to one of its greatest strengths: Accessibility and ease of use. A tough, fall-proof construction rounds off the picture. Unfortunately, one major gripe many users will likely have with the HS170 is the lack of a built-in camera. This really is a drone meant to be flown just for the fun of it, it seems. But make no mistake: At what it does, it’s damn good. 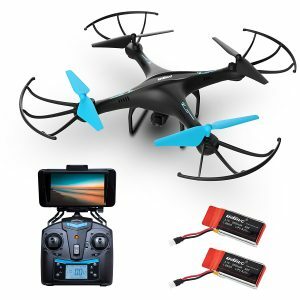 In conclusion, if you mainly want to introduce your child to flying a drone, the Holy Stone HS170 could very well be the best, easiest yet cheapest way to do so. The lack of a camera probably is what will put off many potential buyers in the end, but for pure flying fun, the HS170 can’t be beaten. Just in case you were considering a Holy Stone F181W, but the already low price made you reconsider, there’s the F181C, a slightly less feature-laden, but also more cost-efficient version. The C-model does away with its brother’s smartphone-compatible controls in favor of a discrete system incorporating the analog controller from the W-model and a unique LCD screen. Since the drone doesn’t feature FPV, there is also no way to connect any sort of display to get a video feed of the current flight. This may be a little hard to get used to for some beginners. Other than that, most features remain the same. You still get all the usual flying aids, the exact same drone” save for the camera, which is of a different make and model than on the F181W, but features the same specs overall and mostly the same performance, just with fewer visuals to back it all up. All in all, if you want an F181W, but don’t think too highly of those FPV features that drones costing $100 and up seem to have, then the F181C is a bargain, eliminating a feature that many might not need while not compromising on any of the original product’s great strengths. Of course, the drone isn’t perfect, as evidenced by our review of the F181W, but it still represents a great deal, in this version even more so. 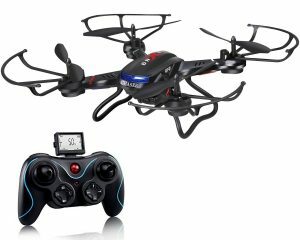 Yet another drone for the budget-minded in particular, the MJX X400W by DBPOWER seeks to be as well-equipped as its low price of $70 allows. With smartphone-enabled FPV for live video feeds, a return-to-home function, a handful of flying aids for the inexperienced, one of the nicest controllers in this price bracket and great looks, the MJX sure looks like a very good proposition. Flying it is great fun, mostly thanks to the well-implemented controls, but the camera is really good for the price, too. Unfortunately, this is still an ultra-low-budget product in the world of drones, which means you’ll have to live with a few minor quirks and flaws. For example, the blade guards, a nice feature, especially for the price, are way to thin and flimsy to be of any real use, easily breaking even without any major collisions involved. In fact, the entire drone is not that durable, to be honest, so you must handle it with care. Especially the camera, in spite of good image quality, has received a lot of criticism for easily breaking. If you don’t mind the subpar quality control on some, then a DBPOWER MJX could be a good, if not great option for those looking for a nice drone to start flying with. The TOZO Q2020 bears some resemblance to the DBPOWER U818A, with a similar ‘four circles’ design scheme. Though the central piece, containing both the HD camera, motors and most of the electronics, is larger, bulkier and more heavily stylized than on the DBPOWER. What sets the TOZO apart from any other drone on our list is the fact that it was specifically designed for a small subset of first-time drone users: Those who, at a young age, want to get into the hobby, but on a small scale and with as little risk and difficulty as possible. Thus, the Q2020 is meant to be flown mainly indoors and at low speeds. 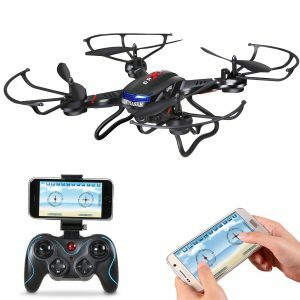 The controls are as easy and responsive as possible, and the drone features many flying aids and helpful features for newbies. Due to its very low range of 45 meters, FPV is not needed and therefore not provided. And, to top it all off, the price of $30 is one of the best deals we’ve ever seen. The untrained eye might mistake the TOZO Q2020 for the world’s greatest bargain on a beginner-friendly drone, but actually, that’s not what it really is. Rather, the TOZO represents one of the best toys that can be used to teach your child how to use a proper drone. The low power, easy controls and low range all make it suitable for indoor use, and in practice, the Q2020 is not much more than an R/C helicopter with four rotors instead of two. If you want to enkindle in your child a fascination for aviation, drones in particular, then this is one of the easiest and most cost-efficient ways to go about it. If you weren’t convinced by the selections on our list, or just want to go hunting for the perfect model yourself, here are some things you should consider about your child’s future drone. The controller can determine a lot, especially how easy the drone feels to fly. Do ask your child about how they find the controls, and look for FPV support”that is, first person view control, the ability to view a live video feed of the flight and control the drone from a first person perspective. Controllers come in a lot of sizes and shapes, so take that into account, too. Many, but not all drones come with cameras built-in, and most of the ones that do also feature some way to mount third-party cameras. Of course, you should ask yourself the question of whether you or your child really need or want a camera on their drone first before paying the necessary premium. Be aware, though, that FPV is not possible without a camera. Also take note that photo and video are not to be taken for granted; some drone cameras only support either. Flight time is, of course, self-explanatory. It generally ranges from 5 minutes and less (bad) to 15 minutes and up (very good). Many drones include replacement batteries, so you don’t have to go charge the drone back up when the juice runs out. Flight time, as posted on the box, can vary depending on weather conditions. 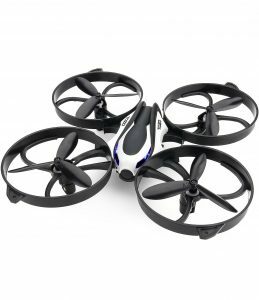 If you are not sure if the kind of drone you’re viewing is suitable for your child’s age, most manufacturers do give an age recommendation for their models. If none is given, it is either assumed to be suitable for users of all ages or mainly for professional use. All drones have a maximum range rating that indicates just how far away from the controller, and by extension the pilot, the drone can fly before losing wireless contact and shutting down. Depending on the drone, range can vary wildly. Some cheaper models, mainly meant for use indoors, can only get about 30 meters away from the pilot without losing their signal, but pro-grade ones and even high-quality hobbyists’ drones can keep going for up to two kilometers or more! Your drone’s weight is important for two reasons. First, it determines how much the drone’s flight path is affected by wind forces. Heavier drones tend to be more stable. Second, the FAA (and its equivalent in many European countries) regulates drones and the certification they require for operating via weight, which means you can buy a lightweight drone (under 0.55 pounds) without needing to have it registered. Tougher regulations kick in as you move further up the weight ladder. The drone’s size is important mainly for practical reasons. Stowing away a large drone simply isn’t as easy as doing so with a more toy-like, miniature one. Some drones can also be folded or are easy to (partially) disassemble for transport. The amount of time it takes to charge the drone back up after the batteries have been depleted shouldn’t be underestimated. Generally, it can take anywhere between 20 minutes and many hours to charge a drone’s battery up, and no matter what, it means taking quite the break as soon as the entire charge is depleted. That’s why extra batteries are always a nice idea. We know, nobody likes safety warnings, but we feel the following tips should be memorized and acted upon by any responsible parent letting their child pilot a drone. It’s simply part of the hobby to do your best to stay safe. The first thing you’ll need to know are your country’s or state’s laws regarding where drones are allowed to be flown. In the US and most European countries, there are a handful of areas that are prohibited for non-professional drone pilots, such as airports, densely populated regions within large city centers, public parks, museums and anywhere else explicitly specified. Consult your country’s or state’s exact laws regarding this matter if you seek a more detailed explanation. Besides knowing where to fly and where not to, it may also be helpful to know just who is allowed to pilot a drone. The answer, luckily, is anyone, at least under most jurisdictions. So, any child of any age can begin drone-flying without legal problems, it’s just important that they keep to the rules. One of those, that unfortunately gets ignored way too often, is the general height limit of 400 feet, or about 120 meters. This is not the same across the globe, but the 400 / 120 number is thrown around often in drone-flying circles as a general guideline. Taking all of this into account, you may want to consider a drone designed for indoor use if you want your child to practice flying in a controlled, safe and perfectly legal environment before letting them try it outside. So, know armed with the knowledge of all things drone-related, are you ready to get your child the UAV it deserves? Feel free to consult this guide should any questions crop up, and do think things through. If something doesn’t sit well with you or if you find a decision particularly difficult, why not consult your child? After all, it is their drone, so shouldn’t they have a say in the decision, too?